Bidding peaked at 18,000gns, 15 lots traded at five figure sums and 136 lots sold to average £6,821 and gross just over £1 million leaving Charolais to once again take the lead at the UK’s spring multi-beef breed sales. A further 10 bulls sold outside the ring later bringing the day’s clearance to 81%. “Market demand has retained modern British Charolais’ position as the terminal sire of choice for the suckler sector,” commented society chairman, Steve Nesbitt, after the five hour stint. “Whilst our Council is encouraging breeders to select for ease of calving without sacrificing growth, producers are aware of their decisions to breed bulls that fit their unit’s strategy; they are leaving Charolais cross suckled calves which are consistently commanding premiums that will contribute towards bridging the income gap in the new CAP Reform era. Sale leader at 18,000gns was Clyth Indestructable TI +51, SRI +52, an 18 month old by Goldies Eddy and out of a homebred heifer going back to Dingle Hofmeister. Bred and exhibited by Ron Mackay, Lybster, Caithness, this first class prize winner was knocked down sold to join Billy Turner’s Brampton herd at Skelton-on-Ure, Ripon. Two lots shared a 16,000gns bid. First to go was the 20 month old Burradon Insomniac TI +51, SRI +52, by 12,000gns Gwenog Banjo from Chris Curry, Thropton, Morpeth to John and James Jeffrey, Kersknowe, Kelso. Minutes later, the same breeder offered Burradon Impresario TI +68, SRI +68, a 20 month old Puntabrava Frederico son for 8,000gns to J and M MacDonald, Dunbeath, Caithness. Mr Curry invested a portion of his takings when he teamed up later with fellow Northumberland breeders, the Campbell family, Thrunton, Alnwick and paid 14,000gns in a two way split for the junior champion, Blelack Imperialist TI +46 SRI +49, a 17 month old by the homebred Blelack Forbes from father and son team, Neil and Graeme Massie, Dinnet, Aboyne. The Massies continued their success with Blelack Digger sons; Blelack Impressive TI +89, SRI +78, a 17 month old made 10,000gns to JS Fraser, Tore, Muir of Ord whilst the same age class winner, Blelack Investment TI +75, SRI +74 was knocked down sold for 9,500gns to James Robertson, Freuchie, Cupar. The day’s second 16,000gns call was made by D and R Durno and Sons, Glenlivet, Ballindalloch for Burnside Indian TI +32, SRI +33, a 19 month old by the 18,000gns Clyth Diplomat from father and son team, Brian and William McAllister, Kells, Ballymena. Two entries went to 12,000gns each. Alsnow Imperial TI +39, SRI +45, a 21 month old Puntabrava Federico son from Alan Lawson and Son, Hallington, Newcastle changed hands with RB Millar, Tealing, Dundee. The second 12,000gns bid was made by Jock Wilson and Sons, Glenkindie, Alford for Goldies Ivan TI +49, SRI +50 from Hamish Goldie, Ruthwell, Dumfries. A 19 month old by the 12,000gns Blelack Edition, he was out of a homebred dam going back to Dingle Hofmeister. Twenty four hours earlier, Ivan had been tapped out by judge, Michael Massie as the intermediate and overall supreme champion. “He was a big, long stylish bull with a lot of breed character,” he said. Mr Goldie’s success didn’t stop there. He sold his entire string of nine bulls to average £8,400 and it was Goldies Uppermost sons that were in demand. They included at 10,000gns the reserve junior champion, Goldies Icon TI +47, SRI +44, an 18 month old to JA Connolly, Ballynahinch, County Down. Two more Uppermost sons made 9,000gns each. First to go was the 18 month old Goldies Idole TI +74, SRI +66 to GW Woolhouse and Son, Ravensfield, Rotherham. A second 9,000gns bid was made by A Sharp and Sons, Tough, Alford for 16 month old Goldies Impress TI +72, SRI +66, whilst the same age Goldies Iconic TI +53, SRI +54 made 8,000gns to A and R Paton, Avonbridge, Falkirk. Senior champion, the 21 month old Balthayock Imperial TI +64, SRI +56 commanded an 11,000gns bid from George Wordie, Glass, Huntly from father and son team, David and Nick Walter, Balthayock, Perth. Sired by the 22,000gns Blelack Forester, himself a senior champion, he was out of a homebred dam going back to Balthayock Adonis. A bid of 11,000gns secured the first class prize winner, Gretnahouse Ivor TI +52, SRI +67 for H MacDonald, Advie, Morayshire. Bred and exhibited by Alasdair Houston, Gretna Green, this 21 month old was by the 12,000gns Wesley Equinox. The same breeder offered the catalogue’s highest recorded entry, Gretnahouse Intouch TI +92, SRI +78, a 20 month old Balthayock Adonis son at 9,500gns to RC Woodburn and Son, Galashiels, Selkirk. Neil Barclay, Crathes, Banchory was another breeder selling to average close on £9,000 for six lots to come under the hammer and it was sons of the 25,000gns Stirling overall reserve champion, Inverlochy Ferdi who were in demand. Leader at 11,000gns was Harestone Ingot TI+45 SRI +48, a 20 month old selling to Jim Warnock, Broughton, Biggar. Minutes later, the same age Harestone Inverness TI +26, SRI +25 was knocked down sold for 10,000gns to JA Cruickshank, Longmorn, Elgin, whilst the next lot in the ring, Harestone Imran TI +59, SRI +43, another 20 month old by Ferdie commanded an 8,200gns bid from J and D Young, Girvan, Ayr. The previous day, Imran took the reserve intermediate championship and went on to be placed in overall reserve supreme position. “Imran has a fantastic carcase, he is full of muscle and power,” said judge, Michael Massie. The day’s final five figure call of 11,000gns went to Elgin Isaac TI +38, SRI +37, a 16 month old class winner from the Milne family, Lhanbryde, Elgin. Sired by the 30,000gns Balmyle Bollinger, he went home with CA Smith, Tarland, Aboyne. Next at 10,500gns was the class winner, Allanfauld Iceberg TI +53, SRI +51, a 19 month old Woodpark Eglin son from Archie MacGregor, Kilsyth, Glasgow to T and H MacKellar, Dallas, Forres. 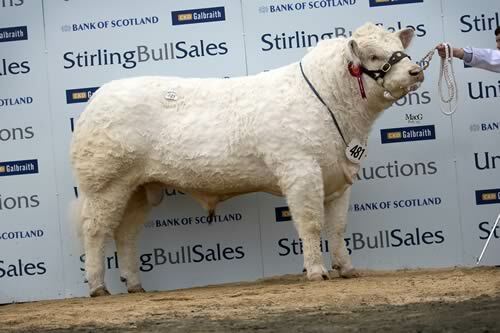 A bid of 9,000gns secured Westcarse Iceberg TI +54, SRI +52 for Mitchelll Farms, Douglas, Lanark. This 17 month old bred and exhibited by John Christie was by the 10,000gns Mortimers Echo. Another 9,000gns price tag went to Dundas Ivor TI +58, SRI +48, a 21 month old by the 8,000gns Elgin Emperor from Jessie Gilchrist, Crawford, Biggar to James Herdman, Edlingham, Alnwick. Two entries by the 26,000gns Balmyle Dickler from the Campbell family, Alnwick were sold for 9,000gns each. First to go was the 20 month old Thrunton Invader TI +59, SRI +53 to T Howden and Sons, Balerno, Midlothian whilst Thrunton Illustrious TI +49, SRI +38 went home with H Wilson, Turnberry, Girvan. The Campbell’s next best at 8,500gns was Thrunton Irelander TI +61, SRI +47, a 17 month old by Dickler to WJ Lewis and Son, Merthyr Cynog, Brecon. Females met a strong demand selling to 4,000gns for the champion, Goldies Happy TI +42, SRI +42, a 15 month old Blelack Edition daughter from Hamish Goldie. The buyer was Messrs Ceregan, Northern Ireland. Hamish Goldie mirrored his success of earlier in the day with his string of six entries leading the female trade to average £3,570. Next at 3,800gns was the reserve female champion, Goldies Havanna TI +22, SRI +19, a 17 month old Edition daughter to A Wright, Girvan, Ayr, whilst two entries were bid to 3,000gns each. First to go was Goldies Haie TI +29, SRI +35, a 16 month old Blelack Blackberet daughter to RL Riddle and Son, Bellingham, Hexham whilst Goldies Isla TI +26, SRI +27, an in calf two year old by Edition went home with Ritch Gordon Street. John Christie, Stirling offered his two year old Mortimers Echo sired Westcarse Iola TI +38, SRI +39 for 3,500gns to Cornish breeders, David and Bernadette Stacy, St Austell whilst heading a draft at 3,800gns from Jack Nicoll Farms, Alyth, Blairgowrie was the last entry in the ring, Mornity Ibetha TI +37, SRI +24, a rising two year old Blelack Challenger daughter to Messrs Taylor, Orkney. Averages: 136 bulls £6,821; 10 females £3,118.50. Mornity: five females £2,362.50.